Almost every contemporary biblical commentary interprets the parable of the Good Samaritan as moral exhortation. But this is not the primary way this parable is understood in the hymns of the Orthodox Church. Most commentaries (and most sermons) read this parable as though the audience is called to identify with the Good Samaritan (who helped the wounded man), not the priest or levite (who passed by “on the other side”). Jesus’ “Go and do likewise” at the end of the passage fits neatly into this interpretation. 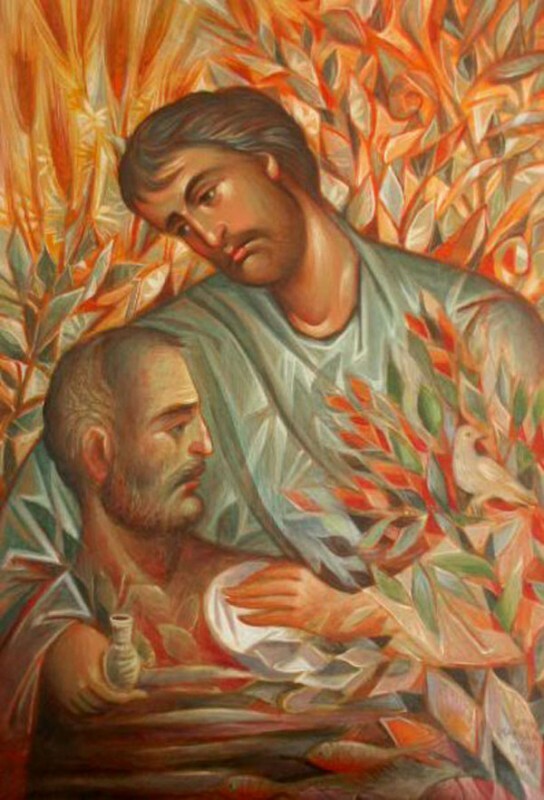 However, the hymns of the Orthodox Church teach us to identify with the wounded man, whom Christ (the Good Samaritan) rescues, binding his wounds, pouring on oil and wine, placing him on His own beast, and taking him to the inn keeper to be cared for until His return. According to the Church hymns, the inn keeper represents the bishops and priests of the Church, the oil and wine are the healing Grace of the sacramental life, the beast is Christ’s own flesh that bore our sins and carried us from death to Life, and the binding of the wounds is the discipline of Church life (through repentance and confession) closing up the deep gashes of sin so that healing can begin. These two interpretations are, of course, not mutually exclusive. After all, those who are in Christ are called to become like Christ, to participate in the Life of Christ. It is little wonder then, that Christians seek to follow the example of the Good Samaritan. However, participating in the Life of Christ is not a simple matter of morality–in fact, I suggest that it has nothing to do with morality, as morality is commonly understood. Participation in the Life of Christ is not about morality, it is about mystical union. It is about being in Christ, and it is this being in Christ that leads us into a Christ-like life, a life that to those around us might appear as a “moral” life. One of the problems with reading the parable of the Good Samaritan primarily as a moral exhortation is that it is easy to comprehend, easy to apply (or at least feel like you are applying), and easy to teach. Easy readings of the scripture, unfortunately, often lead to shallow understanding, and most tragically, to the sense that one already knows the meaning of a passage. Mystery is gone, and the words of Jesus are pressed into a mental box, a category, to be brought to mind as needed. Another problem with this moral reading of the parable is that it places the listener in the seat of the healer, the strong one, the deliverer. Many times I have talked with bewildered Christians who have sought to care for the sick, hungry or homeless neighbor only to be offended that this poor wretched soul didn’t want their help–or if they accepted the sandwich, complained that it had too much mayonnaise. If we in the strength of our own morality seek to imitate Christ, how can we not be offended? Christ was despised and rejected, spit upon and mocked–even as he was pouring out his life blood to save us. 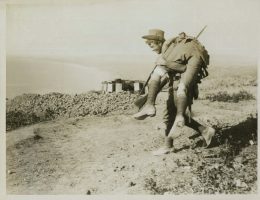 It takes much more than morality to place a wounded man on your own beast (your own flesh) and carry him to the inn. In many ways this offense at the ingratitude of others is a good thing, if it teaches us that we are not the Good Samaritan. It is good to see how shallow our knowledge of ourselves is. It is good to see that in many ways I am more wounded than the homeless person I think I can help: wounded by pride and self conceit, wounded by a high opinion of myself and my abilities, wounded by the delusion that I am the healthy one. 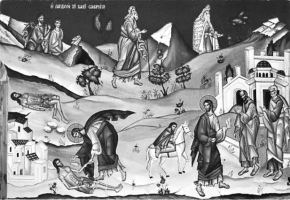 The Church’s reading of this parable, on the other hand, teaches us to see ourselves as the wounded one, in need of a Good Samaritan to bind our wounds and lead us to the inn. It teaches us that this is not an I-did-it-once experience, but a spiritual reality that we enter into (“remember” is the correct theological word) constantly. In fact, the life in Christ is a life of continually remembering that I am the poor and needy one, I am the wounded man in need of the Saviour. And then [deep breath] somehow a miracle happens. 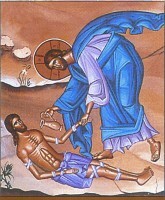 As I am cared for by the Good Samaritan, I become in some small ways like the Good Samaritan. The One who cares for me allows me to share in some small ways in His care for others–and in His suffering.